Thanks for viewing the website for Alpha Storage. look around and if you have any further enquiries, contact us on 0427 621 566 or you can email us - here. for lots of different reasons. We're here to help you make that decision easier. We offer clean, safe, secure and very affordable storage options for all of your storage needs. We sell storage boxes and can arrange insurance for your goods. Call us. We're here to help make your life easier. new addition to the family but still want access 7 days a week. 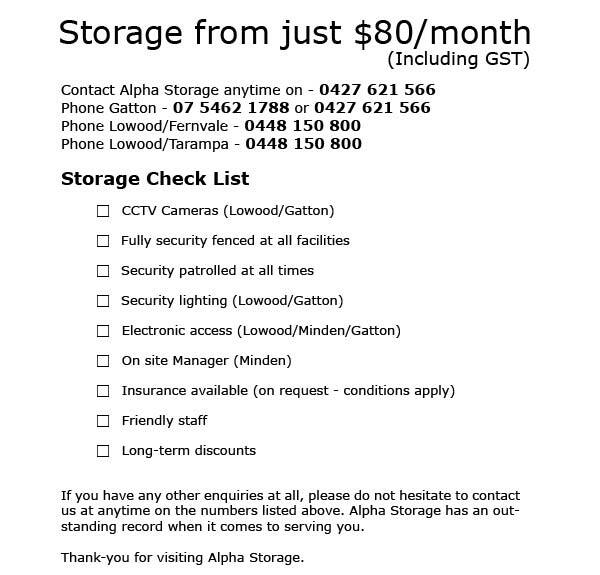 Just call Alpha Storage and we will solve your problems. Need to store your goods to break the housing chain? Again, Alpha Storage provides the convenient, flexible solution. Why do individuals like Alpha Storage? • Access 7 days a week. comprehensive security and modern storage conveniences. of our customers. Our mission is to become an extension of your business users’ premises. Why do businesses like Alpha Storage ? Confidential, secure off-site document storage with archive boxes. boxes or hundreds we’ll have a document storage solution to suit you.